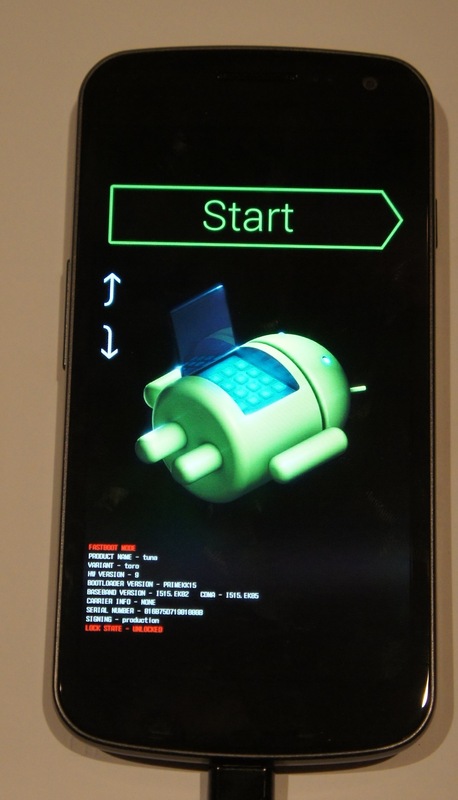 If you haven’t yet, click here to read the guide on rooting your droid incredible. The first thing you need to install a ROM would be the ROM itself (go figure). If you have a droid incredible, I highly recommend downloading the fusion ROM from this post. Fusion is an extremely well-done and compatible ROM based off of CyanogenMod7 (another ROM), so you’ll get the dimension-opening power of 2.3.2 gingerbread. If you don’t want this ROM, you can always do a google search. Not too hard, eh? With the example I’m using (fusion), there are two ROMs. It includes first the base gingerbread ROM, but on top of that it also has a ROM for the Android Market, Gmail, YouTube, and Maps applications, as they do not come by default on the Android base operating system. For now, I am only going to discuss installing the base, but for other ROMs it is sometimes the same situation with the two seperate ROMs. So later on I’ll discuss installing the gapps (dev talk for Google Apps). There are two ways you can get the ROM to your device. The first one involves your computer. Download the ZIP file(s) onto your desktop, then plug in your phone and move the zip(s) onto the root of your SD card. The second way requires an app called Root Explorer (I discussed it in the guide to rooting). On the phone itself, use the web browser to download the ZIP file(s). Then, open up root explorer and navigate to the downloads folder (probably on your sdcard). Then, tap and hold the zip and select move. Navigate to the root of the sd card and tap paste. (Do this with the second ROM if you have one). This is an extremely important step to this, because if you forget to backup then you will never be able to restore your phone to the condition it was in when you rooted. That means that the HTC sense operating system that came on your phone will be GONE. So, you’ll need to boot into recovery and backup. Turn off your phone and turn it back on while holding the down volume button. It will boot into HBOOT, a diagnostics screen. Once it is done checking for update images on the SDcard, use the volume and power buttons to navigate to and select RECOVERY in the menu that you see. It will show the HTC booting screen, but then boot into recovery (with very small fonts, I might add). In this screen, scroll down and select backups (you can now use the optical trackball to do this). Then, select create a backup (or something like that). It might take a while, but eventually a backup should be made of all of your stuff on your phone. So we shall now proceed to the next step. Boot back into the recovery screen by holding the down key and the power button at the same time. 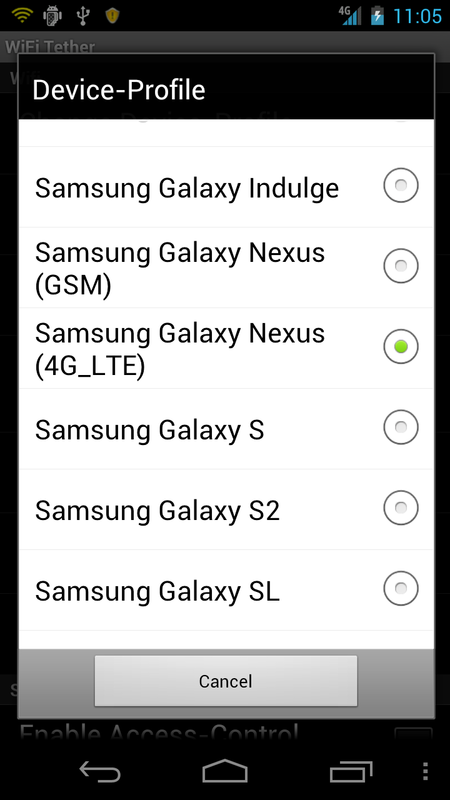 Then, hit Wipe Data/Factory Reset. This will wipe all of the data off of the phone. WAIT WAIT WAIT! I STILL WANT MY BACKUPS! Calm your caps lock keys, wiping the data from the phone doesn’t wipe out the sd card, which is where the backups are. Now, select install zip from SD card. then, select the zip that you either downloaded or transferred over. Then, select the yes, and magically, the ROM will install. Wait a while, and it should be installed and working! Upon first boot it will take a very long time to load. It has to configure everything and get it working. But every time you reboot the device the reboot time should be less and less until it is less than 30 seconds. You might have downloaded 2 zip files to your SD card which you downloaded from the site that gives out the ROMs. This is probably because one of them is a Google Apps zip. Make sure that before you move the two zips on to the sd card, you name them so you can tell which one is the base OS and which is the Gapps. (if you have no idea what I’m talking about, you need to click here and read up on your background info.) Make sure that first you install the Base OS zip, then, after it’s done, select Install zip from sdcard once again and select the gapps zip. Make sure that you don’t hit wipe data/factory reset, because what that will do is wipe out the base OS so you only have gapps and nothing to run it on. Not too functional if I may say so myself. Where to find these ROMs? As I said, the best ROM for the Droid Incredible at the moment is the Fusion ROM. But there’s other ROMS too. One of the most popular is CyanogenMod. They’ve been releasing ROMs with upgraded features since the dawn of time (or android). However, after a little mixup with google, they are no longer allowed to have Gapps on their OS. So you’ll have an android phone with…. no android market. Or gmail. Or youtube. Have fun! One of the easiest ways to find ROMS for your droid incredible is to just google it. If you google Droid Incredible ROMs, a large amount of different websites will show up. If you are too lazy, here’s a direct link to that google search for ya. You’re welcome. Please click here and read up all about what it means to root and install ROMs, then do step 2. 2. YOU NEED AN SD CARD! Make sure you have an SD card in your phone. If you don’t then all hell will break loose and the universe will be sucked into an unknown dimension beyond the horizon of scientific knowledge. Or something along those lines. On your Droid Incredible’s home screen, tap menu, select Applications, tap developer, and check the box that says USB Debugging. unrEVOked is the limera1n for all HTC android phones (hence the capital EVO in the middle). Click here and select which operating system you own. The download will begin. Plug in your Incredible to your computer over USB. You should see a notification that says USB Debugging is enabled. Also, pull down the notification bar and select the USB connection (not the debugging, the other one). 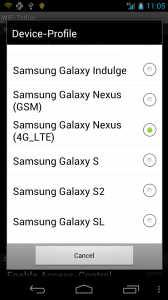 Then, select to have your phone as a Mass Storage Device or something like that (My phone has been screwed over so much that I no longer have the stock htc operating system installed, so I can only be so specific to my knowledge). You should see TWO drives mounted on your computer, one for the internal phone storage and one for your SDcard. Then, hit the reflash button and take cover. Time will pass into another dimension beyond the human eye’s comprehension of life itself. Portals will contradict all possibilities of universal independence. Our very existence will tremble at the rip in the fabric of space and time. After you’re device is rooted it *should* be able to boot into ANOTHER DIMENSION IN SPACE AND TIME…. wait…. into the standard 2.2 htc sense froyo you had before you rooted. However, if you look in your applications drawer, you should see a new app called Superuser. Now, you can run applications that require root access. If you’re on the road and want internet on your computer or iPad, then you’ll have to fork an extra $20 a month to verizon and suffer a 2GB limit. But not if you have Wireless tether! 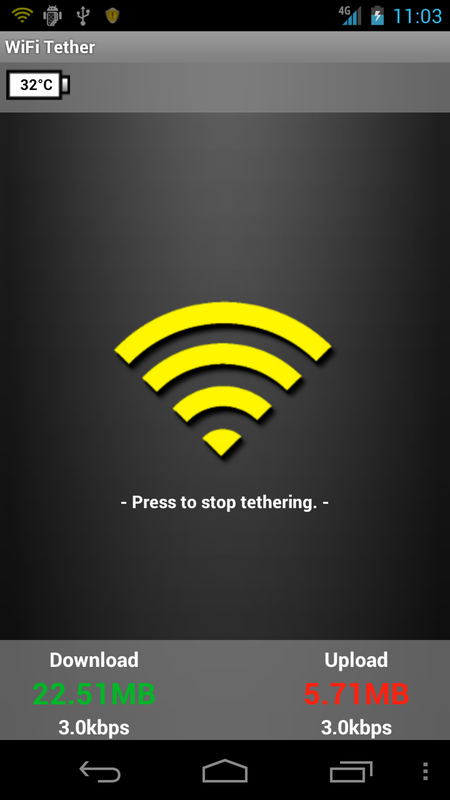 With Wireless Tether, you can create an encrypted wireless network with access control and everything, and the bandwidth limit is only that of your phone’s data plan. You can find Wireless Tether by searching in the android market. If you keep getting warnings telling you that your SD card is full, then you’ll love Root Explorer. You can browse your android’s files, and even delete, rename, or move things around from both the SD card and the internal storage. You can delete those huge downloaded zip files, or all of the pictures you don’t want from the DCIM folder. Handy! This is available in the Android Market as well. If you ever do any kind of posting to a blog about android stuff, this application is a MUST. You can easily take a full resolution screenshot by just shaking the device. Then, you can plug it into your computer and transfer the screenshots off of your SD card. One of the most amazing parts of having a rooted android phone is that you can install other operating systems. Want gingerbread? HTC hasn’t even released the update. But now that you’re rooted, you can install other operating systems without htc’s permission. Here’s a full guide on how to install ROMs. Rooting, Recovery, and ROMs: What it’s all about. So you’ve got an android phone. And you can use the stock operating system with all of the manufacturer’s skinning and apps and versions and keyboard and everything. But if you are feeling a bit ballsy, then you can really take your phone to a true mobile computing level. Here’s the steps to this. Lets explain what all of this is. Rooting means that you can create a way for apps to get superuser access. This is handy for getting to wifi, modifying files, or installing ROMs. For the Recovery, that will usually be installed when you root the phone. The recovery is where you can make and recover backups of the phone, install ROMs, and a slew of other stuff that might come in handy (but could also kill your phone). Once you have the recovery installed (you can’t have the recovery without the root FYI) then the first thing you need to do is make a backup of your phone. This is pretty easy. Just boot into Recovery (just hold down volume on boot and select recovery when given the option), Select backups, and select make a backup now. Your screen will flash many random things, and no matter how long it takes, don’t force shut it down or take out the battery. It will almost always finish. Once you have a backup of your normal operating system, you can go crazy with other ROMs. ROM stands for Read Only Memory. In android poweruser terms, it is an operating system that can be installed on the phone using the recovery mode. You can find many roms on the internet all over the place. XDA-developers is a great place to get ROMs. 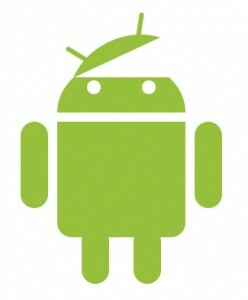 Sometimes a ROM will even be for the next Android version that htc hasn’t released yet. When you download a ROM, it will come as an easy to handle zip file. And from here it’s simple. Plug in your phone to your computer and mount it as a disk drive/USB Mass Storage. Then, just click and drag the ROM from your computer onto the root of the SD card. Eject and unplug the phone, then reboot into recovery. Select install zip from sdcard and select the name of the file that you moved over. Then, choose the yes among the long list of nos to confirm you really want to install it and whabam, you will be installing a new operating system. Then, reboot your phone, and you will be with your brand new OS that you yourself downloaded from the internet and installed on your phone. Unfortunately, this process is different for every android phone. Sometimes there is a one-click root. Sometimes you have to use a command line application to open a port on the phone and install the root like that. But once you have gotten the phone rooted, installing zips is a piece of cake. Aside from installing ROMs, another thing you can do is install and use apps that usually wouldn’t be possible if you weren’t rooted. The one example I am going to use here is called Wireless Tether. And basically, it’s just that. You can make your phone into a wi-fi hotspot with no hassle, just using verizon’s mobile hotspot plan. But that will cost you an extra $20 a month and you have a 5 GB limit before you start getting overage fees. Ouch. With Wireless tether, you can connect unlimited devices, the data comes out of your data plan for your phone, and that also means there’s no overage fees. 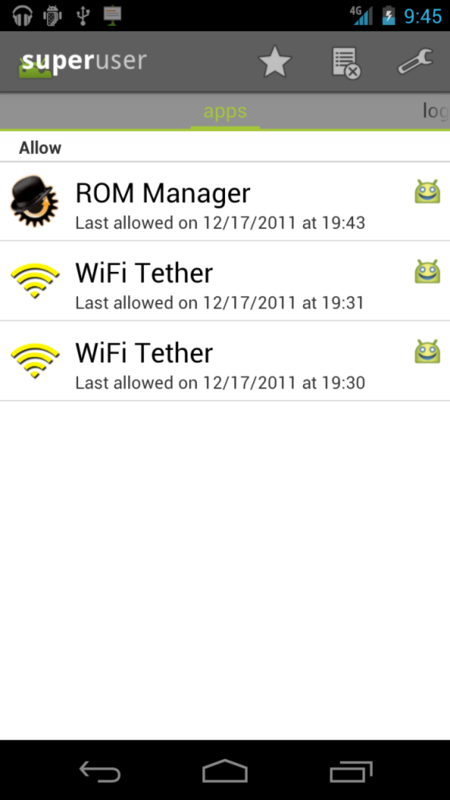 Once you are rooted, just search for Wireless Tether in the android market and you will be able to install it on your phone and use it. You can change the SSID of the WiFi network, and you can even enable encryption and a password on your network. In addition, it allows you to use access control, where you can disable a device’s access to the network. Very handy sometimes. So that is the whole concept of rooting, recovery, and roms. You can find roms for things using google: Just do a search for “[your phone] 2.3 ROMS” or “[your phone] Cyanogenmod” and you should have plenty of luck. If you want to find out how to root your phone, just do a google search for “[your phone] root” and that should turn up some helpful results. If you have a rooted droid incredible, click here to learn about the stable and functional gingerbread rom by WeDoDroid.